Five years ago, Briercrest Seminary developed a strategic plan for an entity that could meet the needs of pastors and leaders around Canada. In partnership with the Leadership Management program that is already a part of the seminary, the Leadership Center allows the program more access to students through practical, everyday coaching. Part of this is to have a third of all of the seminary's programs offered online. The hope is for students who aren’t able to come to the seminary for a modular course, to be able to take classes through an online platform. Dr. Paul Magnus, who has over 50 years of experience developing leaders, is a large part of the formation of the Leadership Center and studio. “We are here today because of past generations who have been faithful,” says McElroy. 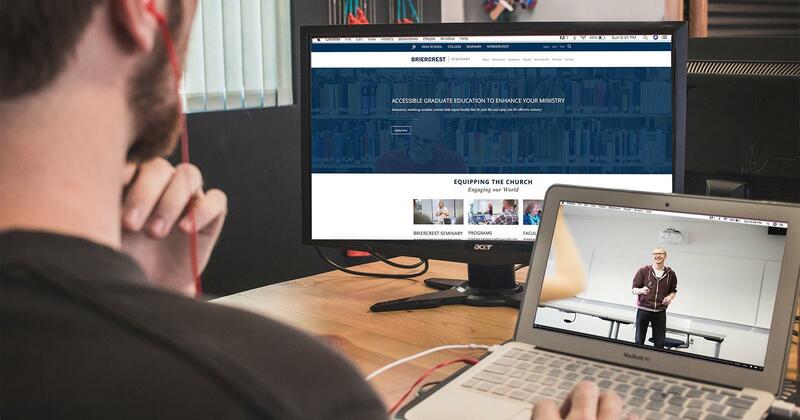 With plenty of questions still to be answered in the area of online education, Briercrest Seminary is dedicated to offering students the best experience possible, even at a distance. The best aspects of my experience have been the freedom that the scheduling provides. Having online or modular classes has allowed me to focus on the material in my own time and to ponder the implications of how my learning will impact my life.